Last year, the City of Oswego implemented an “Alternate-Side Winter Parking Restriction.” This was a change from the previous Winter Parking Ban, which had been in place for many years. The purpose of this change was to offer options to those who otherwise have no alternate parking solution. This year, we will again be utilizing the “Alternate-Side Parking Restriction” during the winter months; however, discretion will be used in imposing the restriction until weather conditions require it. It will be publicly announced when it is imposed. -On even calendar days, park on the even side of the street, and on odd calendar days, park on the odd side of the street. -Alternate Side Parking applies unless otherwise prohibited and where allowable. -Be aware of instances where the last day of the month and the first day of the month are both odd-numbered days (ex. January 31st / February 1st). We understand that this will not provide a solution for every parking situation, but it will offer some relief to help us throughout the winter months. 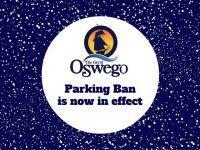 The Oswego City Police Department will issue “Courtesy Notices” for the first several nights that the parking restrictions go into effect to further advise residents and visitors of the restriction change. Following this “grace period” any vehicle found to be inviolation of this ordinance will be subject to ticketing and towing. We strongly suggest using off street parking options that may be available to assist our DPW crews in clearing the roadways for our safety. However, if the alternate side parking option is used, we highly recommend added attention to the manner in which vehicles are parked. Any violations following the “grace period” will be strictly enforced.